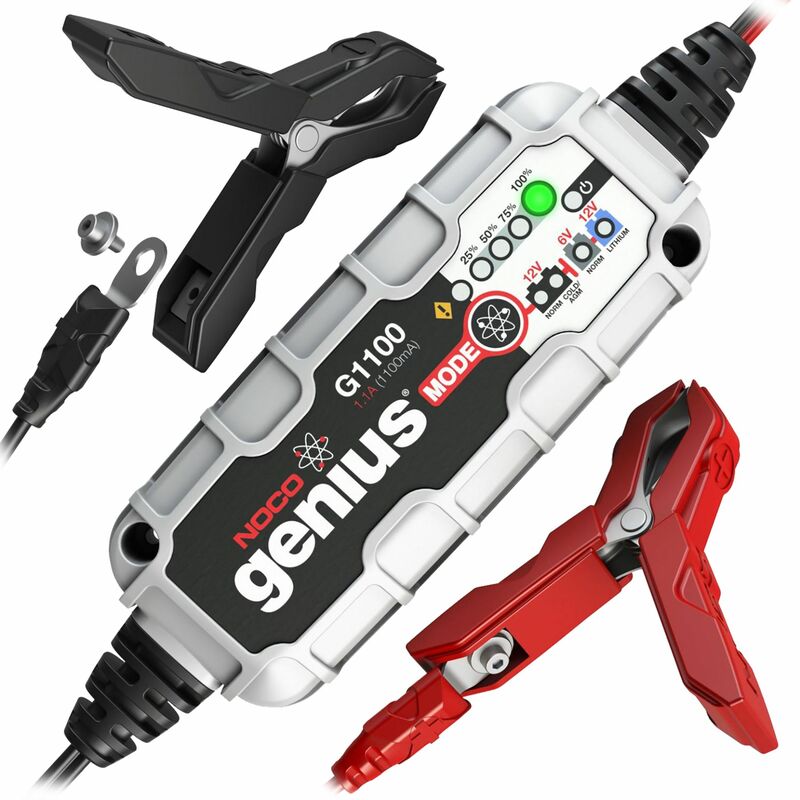 The G1100 is a portable automatic battery charger and maintainer for both 6 V and 12 V lead-acid and lithium-ion batteries. Designed for charging a Motorcycle, ATV, Snowmobile, Personal Watercraft, Lawn Mower and much more. It also can be used as a battery maintainer to keep a Car, Boat, RV, and deep-cycle batteries fully charged. And it monitors battery activity for safe and efficient charging without any overcharge and complete with a built-in battery desulfator to rejuvenate underperforming batteries. The G-1100 charger is a fully microprocessor controlled charger that is perfect for batteries in the 2.2-40 amp hour ratings. It also can effectively maintain larger batteries such as RV batteries. A 6 V and 12 V battery charger and maintainer. Low starting voltage: 2 V (12 V), 2 V (6 V). Recovers deeply discharged batteries down to 2 V.
AC Input Cord 5 ft, DC Charging Cord 5 ft.
Do you own the G-1100? Please, tell us what you think about it. It helps us provide you with better products. Please note that it may take up to 72 hours for your review to appear. Cons: the charger has been plugged in to a generator that has a battery to be used for a key start, or a remote starter. All lights on the charger are flashing simultaniously, yet the key won't start the generator, nor will the remote. It does start using the rope pull. What do the flashing lights indicate? the charger has been plugged in to a generator that has a battery to be used for a key start, or a remote starter. All lights on the charger are flashing simultaneously, yet the key won't start the generator, nor will the remote. It does start using the rope pull. What do the flashing lights indicate? Pros: THE CHARGER IS WORKING FINE AT THIS TIME. Pros: Haven't had to use it yet, thankfully, but wanted to state that I again received the finest service and fast shipping with a great price the Battery Stuff has always excelled at. Pros: Compact, easy to read, intelligent, and easy to use. I love this battery charger. I predict that it will increase the life of my motorcycle battery. I love this battery charger! Pros: The best. plug-in and forget it,it will keep the battery charged. keep battery like new, always will start. Pros: Great little charger . Use it on my tractor four wheeler and motorcycle to keep a good charged battery during winter. Love the fact it monitors itself when I forget I've hooked it up and left it for several days. Pros: All aspects of order went perfect and device was easy to install. No darn sales tax, YES! ! ! ! ! Cons: Nothing, best price on the Web as well! Will always have one of these units on any vehicle I own. Pros: With multiple small batteries (8) to maintain all winter I have been impressed with this unit. I have purchased the big store sale chargers for small batteries and they do not seem to perform as well as this unit.I also have 2 'Battery Tender' models and they have also performed very well. Cons: Unusual joint connecter, not a SAE but their own, makes it hard to share chargers but, like I said in my knowledge line, electricity doesn't scare me usually, so I make pig tails to share chargers.They don't call me the Arc master for nothing. Love your site... great information, easy to navigate and generally a rewarding experience for answers to questions. Cons: Bought two last year and they did not last a year but Noco did replace them two and I bought two more for other equipment, maybe they will last longer. Pros: This is the best battery charger that I have ever owned. For its size, it is great. And it works great with my Lithium Battery. Cons: The only con I can think of now is that I have to put a con in this space or it won't accept my review. Cons: Does NOT come with SAE adapter!!! I would've given this 5 stars...but BEWARE if you own a motorcycle/jetski/etc. and use a 2 prong SAE connector. This does NOT come with the SAE adapter!!! They want you to spend an additional $10.00USD to get the adapter! So...if you order this...add the GC009 X-connect SAE adapter to your cart!!! ***Note from BatteryStuff - The unit does ship with an integrated ring connectors attached to the alligator clips. This ring connectors can be disconnected from the alligator clips allowing you connect to battery directly with the other end being NOCO's quick disconnect. Setting it up like this will not require you to have to purchase any other quick disconnect connector unless you want to charge another battery using another manufacturers quick SAE quick disconnect.